Chris reached out to me about two months before his proposal. I was admittedly driving when I saw an Instagram direct message from him. Now, we all know Chris & Nora were going to get engaged sometime soon after graduation and before or soon after the new year. So, when I saw a message from Chris, I knew it could only be one thing. My response to Chris was "Omg I'm driving and I'm like giggling screaming getting the chills." Chris found the perfect day, December 21st. This was the day he was going to propose to Nora. I took a drive up to New Hampshire and found the park Chris and I talked about. This was a park in his hometown that he wanted to show Nora around to for the first time. Chris, Nora, Chris's sister and step brother all went out to lunch together. Chris's sister and step brother had to create an excuse to leave their super fancy lunch early, so naturally, they said they were going shopping for the holidays. When they left lunch, Chris's sister and step brother came by the park and dropped off champagne, a very nice piece of stationary that Chris picked out (haha) and a love letter that Chris wrote. About 20 minutes later, Chris and Nora came to the park. I was waiting in a stone building with a perfect view of the bench & arbor. Chris and Nora came by the building after a long anticipated day, and Chris nodded his head towards the bench so Nora could see the surprise. It was all downhill for my emotions after this. Nora sat down with Chris, she gave him a look, didn't say a word, opened the bag, and began reading the love letter. Chris turned to me because I was staring them both down of course, and he gave me a smirk. A few seconds later, Chris was slowly reaching into his chest pocket to take out the ring. Chris got down on one knee, asked Nora to marry him, and Nora fell to her knees as Chris was still down on his knee. I broke down. I couldn't see through my glasses. I shouldn't have worn mascara that day. Yes, everyone was crying. My hands were shaking because 1. NH, you are cold, and 2. I couldn't contain my emotions. Nora had no idea I was capturing this moment. 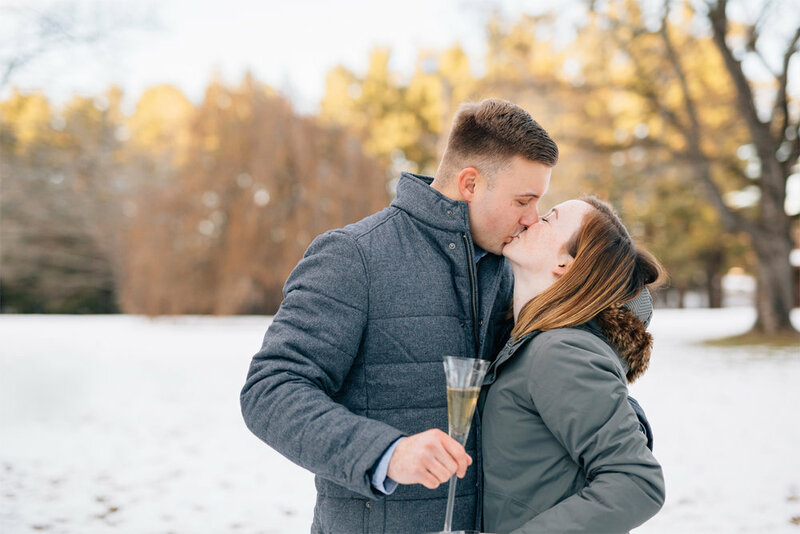 They soaked in the love for a few minutes with a lot of kisses, hugs, and a champagne toast. Finally, Chris turned towards me after about what seemed like 2 seconds but was probably 5 minutes, and Nora motioned the same way, saw me, and screamed. That's when I knew Nora definitely didn't see me prior to that moment. They were in their own little bubble and I cannot believe I was able to capture this for them.